Since pre-industrial times, the world's oceans have absorbed 41 percent of the carbon dioxide humans have released into the atmosphere. The remainder stays airborne, warming the planet. The colors on the globe correspond to how long it would take to see the difference between natural variability and the influence of humans on the ocean-carbon sink (aka, the time of emergence). The blue stars indicate seven sites where direct measurements of the ocean-carbon sink are made on a regular basis. Image: Galen McKinley. The relationship between our future carbon dioxide emissions and future climate change depends strongly on the capacity of the ocean-carbon sink. How efficiently will it continue to soak up what we emit? That is a question climate scientists have so far been unable to answer because of limited opportunities to take robust ocean-atmosphere measurements around the planet and because of inherent challenges in existing computer models. In a new paper published in Nature Thursday, Feb. 25, 2016, a research team headed by Galen McKinley, professor in the University of Wisconsin-Madison Department of Atmospheric and Oceanic Sciences, describes the best modeling approach to date for arriving at an answer to this and other crucial climate questions. "It's an evolution in our ability to use climate models to make predictions, particularly on timescales of a few decades," says McKinley, also an affiliate of the Center for Climatic Research at UW-Madison's Nelson Institute for Environmental Studies. This improved predictive capacity could allow scientists to better understand what changes to expect, where to expect them, and their magnitude. It could also lead to better allocation of limited resources to enhance monitoring efforts, or to the creation of specific policies to mitigate change. McKinley will present the Community Earth System Model findings on Tuesday, Feb. 23, at the 2016 Ocean Sciences Meeting, which is co-sponsored by the Association for the Sciences of Limnology and Oceanography, The Oceanography Society and the American Geophysical Union. A variety of natural factors influence global climate, from solar variation to volcanoes, but anthropogenic greenhouse gas emissions also change the nature of the planet. Researchers want to distinguish the difference, especially in the context of large fluctuations in annual weather. They want to discern the role humans play in a changing climate. "In Wisconsin, we might have a winter that is very cold, even though the overall climate is slowly and steadily warming," McKinley explains. "The swing to a very cold year is natural variability, and what we want to be able to uncover and understand is the magnitude of the slow and steady trend occurring at the same time as these large swings." Prior climate models have lacked the fundamental computing power necessary to find the human signal above the noise of a variable climate system, McKinley says. This has been particularly true of the ocean-carbon sink. The new study employed massive computing resources at the National Center for Atmospheric Research (NCAR), funded by the National Science Foundation (NSF), to perform a large number of simulations using a single model. This meant any variability detected would be inherent to the modeled climate system itself and not because of differences between models. "What this does is let us determine how big that variability is and how it changes as timescales lengthen. We're better able to see when human activity begins to affect the ocean-carbon sink," she explains. "This is really a first step in using this new technique to understand a host of issues in terms of climate change, and it's not restricted to ocean carbon or biogeochemistry or physics. People are also using it to look at precipitation and temperature changes." 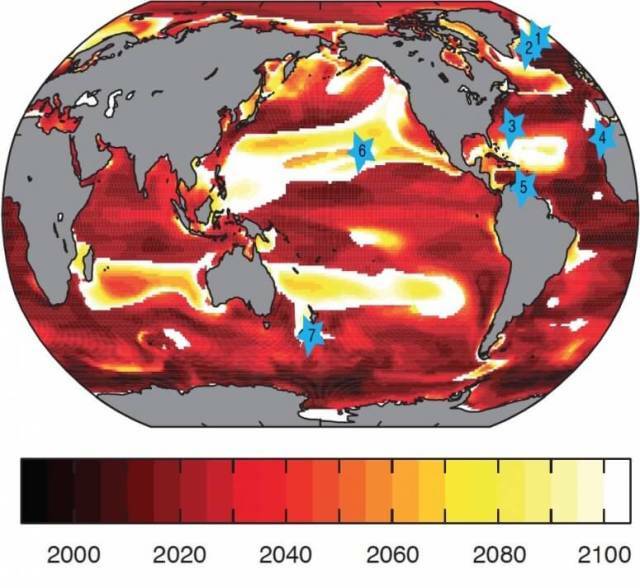 For assessing the global ocean-carbon sink, McKinley and her co-authors from the National Oceanic and Atmospheric Administration (NOAA) Pacific Marine Environmental Laboratory, NCAR and the University of Colorado Boulder used the model to establish a long-running climate scenario from historical data. Then, on model date Jan. 1, 1920, the researchers created a "slight perturbation" within the system: a slight rounding of the calculations for air temperature. Then, they looked at what happened. "It was just a butterfly effect, a small change in the atmospheric temperature fields," McKinley says. "You perturb it oh-so-slightly and the model takes distinct paths of variation." With this single, slight change the researchers elicited 32 different simulations -- built on all the same assumptions -- that represented some of the different ways the same climate system could evolve. "It's like a swirl of creamer in your coffee cup," says McKinley. "You can stir it today and it will look like this, but you stir it tomorrow and the pattern is different. You're using the same spoon, the same cup, the same coffee, the same creamer, but the swirls look different. This is how our climate system works." And yet, she says, regardless of the shape the swirl initially takes, the coffee will still end up the same lighter color, unless something else changes, like pouring in additional creamer. "We know that if we put carbon in the atmosphere, we will get an ancillary effect, the climate will warm," she says. "But how we get there are those swirls ... we are now starting to realize that variability is still strong on timescales of decades and we don't have as much ability as we would like to predict it." In using the model to assess the ocean-carbon sink, the researchers assumed a "business as usual" carbon dioxide emissions trajectory, the Representative Concentration Pathway 8.5 scenario found in the Intergovernmental Panel on Climate Change for 2006-2010, where emissions continue to rise throughout the 21st century. The model also accounted for natural drivers of change, including the direct influence of increased carbon dioxide on ocean-carbon uptake and the indirect effect that a changing climate has on the physical state of the ocean and its relationship to atmospheric carbon dioxide. For example, carbon dioxide is less soluble in water in a warmer climate. The model showed that regions of the subpolar and equatorial Atlantic Ocean are undergoing changes that can already be detected through the noise of variability. Here, the ocean-carbon sink has increased, absorbing more carbon dioxide. However, changes to the sink in the Pacific and Indian Ocean subtropical regions will be too low-resolution to detect before at least 2050. The researchers also checked the model against actual ocean observations. "What we find is that observations today are not sufficient to be able to see change in the ocean-carbon sink," McKinley explains. "We can see that there is a sink, but at any one location, we don't have enough data to say that the sink is increasing or decreasing." The ability of any particular ocean or region of an ocean to absorb carbon dioxide depends in part on local features like how much exchange there is between surface and deep sea water. Taking measurements in some of these areas can be complicated. The model may help guide efforts to focus on particular regions and devote resources to these areas. But the models themselves aren't easy to develop, which is why they are another step in the process and an improvement upon the tools previously available. "If you want to calculate how all the wind moves, how the ocean circulates, how the chemistry in the atmosphere happens, the productivity on land, that's a lot of computer code and you want to do it at the highest resolution possible," McKinley says. "What we're really trying to do is represent all the complexity of planet Earth with a computer, so you can imagine how complicated that would be." McKinley's goals are to continue to build upon the capabilities of the model. "What does Wisconsin look like 10 years from now? That's really hard to say," she says. "But we can provide ranges of expectations with broad variability, and use these techniques to quantify it." "You know you can't be sure on any given day that it's going to be too cold to go skiing, or there's going to be enough snow," she adds. "But we want to know: What is the likelihood that we'll have winters where skiing isn't doable or ice fishing on the lake is a lot less possible?"